The Cockrell School of Engineering's research units and centers coordinate and promote faculty and student research extending across and beyond campus. These centers also provide and maintain specialized research facilities for faculty within designated fields. The Center for Aeromechanics Research conducts computational, analytical and experimental research in supersonic and hypersonic aerodynamics, high temperature gas dynamics, turbulence, combustion, laser diagnostics, aeroelasticity and structural dynamics, control of flexible structures, and flight structures. The Center for Electromechanics performs leading-edge basic and applied research in electrical and mechanical engineering, with a special emphasis on applied engineering leading to prototype development in electromechanical devices and systems with high specific power, force and/or energy storage or other unique attributes. The Center for Energy and Environmental Resources focuses on efficient and economical use of energy and on ensuring a cleaner environment by developing, in cooperation with industry, processes and technologies that minimize waste and conserve natural resources. The Center for Engineering Education in the Cockrell School of Engineering conducts research on learning and retention and puts the results into practice for UT Austin students. The Center for Mechanics of Solids, Structures and Materials promotes research addressing fundamental, as well as applied, issues in the broad field of mechanics of solids, structures and materials, particularly in areas such as materials science and engineering, manufacturing and the durable design of a variety of microelectronics devices. 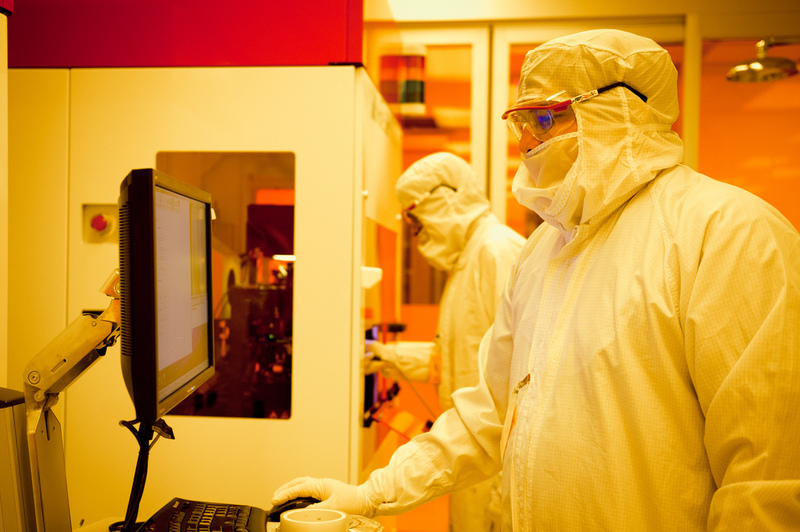 The Center for Nanomanufacturing Systems for Mobile Computing and Mobile Energy Technologies (NASCENT) develops high throughput, high yield and versatile nanomanufacturing systems to take nanoscience discoveries from the lab to the marketplace. It is a multi-university research center led by UT. The Center for Petroleum and Geosystems Engineering aims to be the premier academic research organization in all facets of oil and gas exploration and production, enabling energy security that balances environmental impact and affordable resources. The Center for Space Research is a leader and innovator in mission planning, design and execution of spacecraft, aircraft and ground-based campaigns. The Center for Transportation Research is one of the leading university-based transportation research centers in the world and works to promote cutting-edge developments in transportation science and technology. The Center for Water and the Environment carries out advanced research, education, design and planning in water resources and environmental management in Texas, across the United States and internationally. The Construction Industry Institute is a consortium of more than 130 leading owners, engineering contractors and supplier firms from both the public and private arenas. The Ferguson Structural Engineering Laboratory consists of a structural test facility and a wide range of loading equipment, enabling large-scale studies of structural behavior. The results of these studies are translated into practice by the active participation of the faculty in code and specification committees. The Microelectronics Research Center performs education, research and development in materials and electronic devices. The Texas Materials Institute operates the materials science and engineering graduate program, provides the instrumentation necessary to conduct modern materials research and promotes interdisciplinary research in materials science and engineering. The Wireless Networking and Communications Group focuses on research, education, technical innovation, imagination and entrepreneurship in wireless netowrking, communicatiosn and data sciences. Applied Research Laboratories at The University of Texas at Austin is a Department of Defense University-Affiliated Research Center that engages in sponsored research dedicated to improving our national security through applications of acoustics, electromagnetics and information sciences. The Energy Institute leverages UT Austin's breadth and depth of expertise to educate the energy leaders of tomorrow, foster innovation and inform the policy-making process through rigorous, interdisciplinary research. The Center for Perceptual Systems in the university's College of Liberal Arts is an integrated program in perception, neuroscience and computation. The Institute for Cellular and Molecular Biology in the university's College of Natural Sciences focuses efforts on the revolutionary developments occurring in molecular biology, genetics, cell biology and genomics. The UT Institute for Computational Engineering and Sciences fosters the development of interdisciplinary programs in computational sciences and engineering, mathematical modeling, applied mathematics, software engineering and computational visualization. The Center for Predictive Engineering and Computational Science in the UT Institute for Computational Engineering and Sciences is dedicated to the development and application of tools and techniques for making reliable computational predictions of complex systems.